To evade serious systemic side-effects in cancer chemotherapy, we devised a novel injectable agent which could prevent tumor growth by its loco-regional administration and basically examined the anticancer effects with the novel product. 70% deacetylated chitin (DAC-70) was used. First, we prepared DAC-70 sol by our original technique to form a novel anti-tumor agent. The growth-inhibition was examined in vitro by WST assay method using tumor cell lines. Anticancer efficacies with the agent were evaluated in vivo using tumor-bearing animals. In in vitro studies, the DAC-70 sol demonstrated anti-proliferative effect against each tumor cell line. In in vivo studies, intra-tumor injection of the agent inhibited rapid growth of the tumors and suggested significant necrosis in the tumor masses with the prevention of enhancement of neoplastic vascular systems. Intra-peritoneal injection of CDDP/DAC-70 sol conjugates prolonged survival time of the malignant ascites-bearing animals. No evidence of serious side-effects was observed in this animals. Topical administration, not systemic use, of our own DAC-70 sol basically suggested anticancer effects in cancer treatment. Systemic administration of anticancer drugs is essential in the treatment of cancer. Various kinds of anticancer drugs have been therapeutically used in current cancer chemotherapy, while such applied anticancer agents often induce serious side effects. In ideal cancer chemotherapy, anticancer agents with minimal side-effects are needful. In an attempt to avoid the serious side effects in cancer chemotherapy, we newly prepared an anti-tumor agent by the application of natural marine material, chitin and the derivatives with minor toxicity. In this paper, we introduced our own preparation procedures of the novel agent and the results of basic studies with the material. Based on the results, we also proposed a novel concept for anticancer chemotherapy. 70% deacetylated chitin (DAC-70: Koyo Chemical Co. Ltd. Osaka, Japan), Aminolevulinic acid (ALA: Wako Pure Chemical Ind. Ltd. Osaka, Japan), HeLa cells, HCT 116 cells and HFSKF-II cells (RIKEN BRC Cell Bank, Tsukuba, Japan), Nutrient Mixtures for cell culture: RPMI 1640 medium (Life Technologies Corp, Grand Island, NY, USA), Ham F-12 medium (Gibco by life technologies, USA),Cell Counting Kit-8 reagent (CC Kit-8; Dojindo Laboratories, Kumamoto, Japan),Fetal bovine serum (FBS: Gibco by life technologies, USA). Other reagents used were analytical grade. 200 mg of DAC-70 powder was gently dissolved into 9 mL of 0.1M HCl solution, into which 1mL of glycerol phosphate solution (560 mg/mL of distilled water) was added a drop at a time. A 10mL portion of the 2% DAC-70 sol was prepared. Such prepared sol was lyophilized and crushed to fine granules to make DAC-70 flakes (DAC-70 Fl). 100 mg of the DAC-70 Fl was dissolved in a 5 mL of physiological saline solution (2% DAC-70 sol). We prepared DAC-70 sol in two different ways; namely, direct method and indirect method. CDDP loaded DAC-70 sol, a CDDP/DAC-70 sol conjugate was also correspondingly formed following these procedures. The procedures are schematically shown in Figure 1. It was immersed into distilled water with hydrochloride (HCl) solution　and added glycerol phosphate (GP) solution gently stirring to change sol form (DAC-70 sol). This was the direct method to prepare DAC-70 sol. CDDP solution was added to the sol to prepare CDDP/AC-70 sol conjugate. On the other hand, the DAC-70 sol was lyophilized and then, broken to fine pieces, DAC-70 flakes (DAC-70 Fl). Such prepared flakes were easily changed to sol form when added some kinds of liquid. This was the indirect method. When CDDP solution was added to the Fl, it was soon transformed to CDDP/DAC-70 sol conjugate. Release profile of the CDDP from such prepared conjugates was examined in in vitro by HPLC assay method. The cancer cells were cultured in the RPMI medium with 10% FBS (pH 8), and　the HFSKF-II cells were cultured in Ham F-12 medium with 15% FBS (pH 8). 20 μL of each cell suspension (including 5,000 counts of tumor cells) was seeded in each well of a 96-well plate. After culturing for 24 hours, 80 μL of RPMI medium or Ham F-12 medium mixed with the DAC-70 sol, at the rate of one to one in volume, were separately added into the wells. Thus, cells were exposed to the DAC-70 sol. After 24 hours’ incubation at 37°C, 10 μL of CC Kit-8 was added to each well. About 3 hours’ additional incubation, the plate was set to WST assay to record proliferation degree of each cell. To reconfirm the viability of such treated cells, we carried out a second trial modifying conventional PDD method [1,2], viz., the tumor cells were individually cultured as usual. Then, HCT 116 cells and HeLa cells were incubated in the mixed solution of RPMI medium containing ALA/physiological saline solution, and HFSKF-II cells, in the mixture of Ham F-12 medium with ALA/physiological saline solution. After 24 hours’ incubation, each cell treated was microscopically observed under blue light (wave length 380-410 nm) in a dark room to detect reddish-pink fluorescence emitted from viable cancer cells. In this observation, we originally used a red cellophane sheet as a filter to emphasize the specific fluorescence. We used two different types of cancer-bearing animals: namely, solid tumor-bearing (HCT116 tumor) BALB/c mouse models and malignant ascites-bearing (MM-46 ascites) C3H mouse models. Two million count of HCT 116 cells were subcutaneously injected on the back of BALB/c mouse for a solid tumor model. Changes in tumor volume were periodically measured. When the tumor volume reached 200 mm3, the time was defined as day 0, and two different types of treatments were started from the day; namely, intra-tumor injection (it) of 2% DAC-70 sol (0.2 mL) or CDDP solution (0.2 mL), which were carried out on day 0, day 7 and day 14. Four mice were treated with DAC-70 sol, another 4 animals, CDDP solution and 3 were received no treatment as the controls. After the treatments, changes in tumor volume were also periodically recorded. The volume was calculated as follows; (long diameter) x (short diameter)2/2 (mm3) .On day 24, the animals were sacrificed for pathological studies. To prepare malignant ascites-bearing animal model, 5 x 105 counts of MM-46 cells were injected into the peritoneal cavity (ip) of　C3H mice. We prepared five different types of anti-cancer agents for the study; namely, two types of DAC-70 sols formed in direct and indirect method, two types of CDDP/DAC-70 sol conjugates prepared in both direct and indirect method, and CDDP solution. Each treatment was tried to more than 12 experimental animals, on the 12th day and 19th day after ip injection of MM-46 cells. No treatment was served to 12 animals as the controls. Survival term of the animals was recorded for longer than 4 weeks after inoculation of the malignant cells. The DAC-70 sol was a visco elastic solution, easily injectable through a 21-G needle. It showed no changes in appearance or viscosity during 2 months of storage at 4°C . In in vitro studies, the sol demonstrated anti-proliferative effect against each tumor cell line in WST assay. The sol revealed to have nearly equal anti-cancer potency to that of CDDP and 5FU. 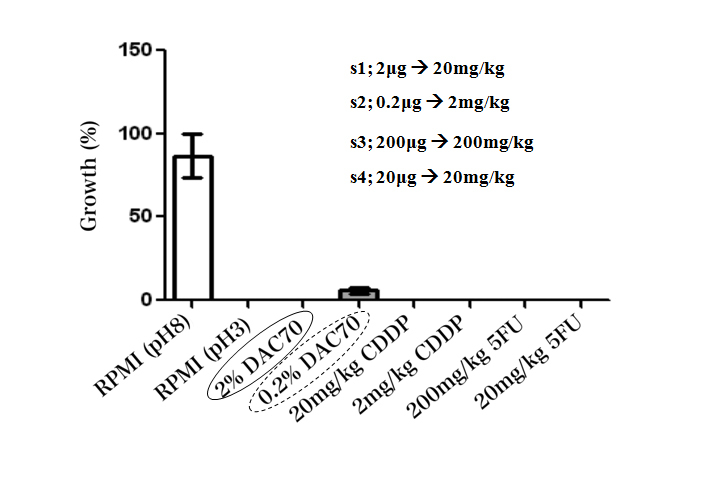 The RPMI medium adjusted in pH 3 showed a strong anticancer potential, and 0.2% DAC-70 sol provided a lesser anti-cancer effect against the HCT 116 cells (Figure 2). 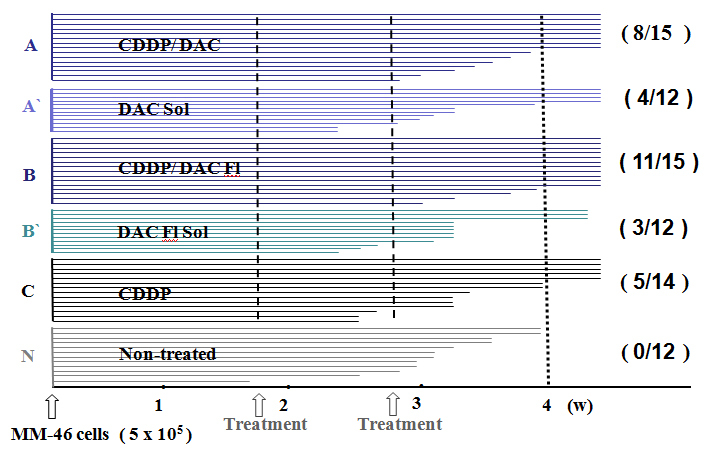 Our modified PDD also suggested that almost of each cell treated with the 2% DAC-70 sol lost their viability. The viability of the cells was completely lost by the treatment with 2% DAC-70 sol, CDDP solutions and 5FU solutions. CDDP showed effective cytocidal function in the concentrations of 20 mg–2 mg/kg, and 5FU, in the concentrations of 200 mg–20 mg/kg. The RPMI medium adjusted in pH 3 also showed a strong anticancer potential, and 0.2% DAC-70 sol provided a lesser anti-cancer effect against the HCT 116 cells. p<0.01. In vitro release profile of CDDP from the conjugates prepared by indirect method gradually reached to 100% of loaded amount of the drug within 12 hours and maintained 98% of the level for longer than 48 hours. That from the conjugate prepared in direct method showed much slower sustained delivery of the CDDP. 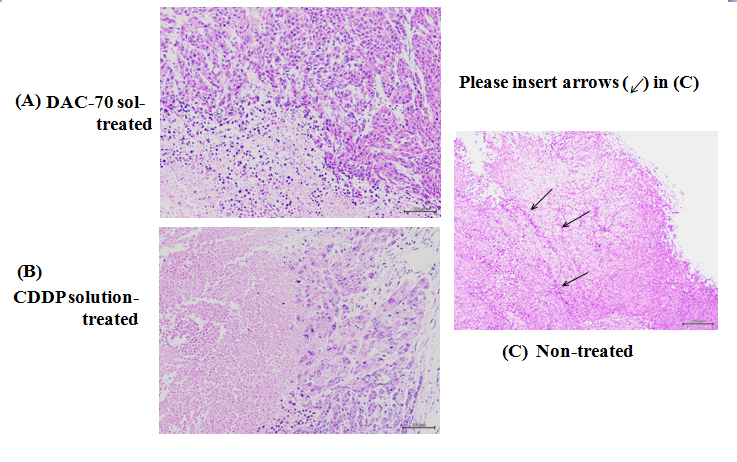 In in vivo studies, intra-tumor injection of DAC-70 sol prevented rapid growth of the HCT 116 xenografts on the animals and induced significant necrosis of the tumor masses with remarkable inhibition of the enhancement of neoplastic vascular systems (Figure 3). But no reduction of the tumor size happened. As for ascites-bearing animals, survival time of the C3H mice was prolonged by intra-peritoneal injection of two kinds of CDDP/DAC-70 sol conjugates. In such treated animals, the ascites reduced significantly, and no signs of recurrence were encountered during the term of the observation. No evidence of serious side effects was also observed in these animals. The survival time of those treated with the other agents was unfavorable (Figure 4). (A)	2% DAC-70 sol-treated tumor: Necrotic changes were remarkable at the central areas of the tumor. (B)	CDDP-treated tumor: Necrotic degeneration was significant (p< 0.01). Viable cells still remained at the marginal area of the tumor. The animals treated with CDDP/DAC-70sol conjugates (A and B) survived for longer than 4 weeks at the ration of 8/15 and 11/15 respectively. These long-survived animals encountered no evidence of recurrence, metastases and side effects such as cachexia, diarrhea and loss of appetite. They all seemed to be healthy. As for the other treated mice (A`,B` and C), their survival time was shorter. None of non-treated group survived longer than 4 weeks. The cause of death was cachexia due to the accumulation of malignant ascites. Metastases to the peritoneum, liver and lugs were significant (p<0.01). Our newly designed 2% DAC-70 sol demonstrated anti-proliferative functions in vitro and growth-inhibition effect on HCT116 solid tumors in in vivo. The ip administration of CDDP/DAC-70 conjugates also provided anti-cancer efficacy with prolongation of survival time against MM-46 ascites-bearing animals. Direct application of the novel agents into the malignant sites showed a favorable anti-cancer efficacy both in vitro and in vivo. Based on these results, we would like to propose that intra-tumor injection of anticancer agent with minor side-effects, e.g. DAC-70 sol, is one of clinically useful options in cancer chemotherapy. In this study, we additionally found that RPMI medium adjusted in pH 3 provided a strong anticancer potential. We also consider not only an anti-cancer effect but also the environmental pH values might play an important role in maintaining the viability of the living cells. Chitin and the derivatives have been mainly purified from crustacean shells such as crabs and shrimps. They are polysaccharides widely distributed in nature [5,6]. Concerning chitosans, the materials have been recently investigated in cancer treatments as the vehicles of anticancer drugs or basic materials of nanoparticles [7-9]. 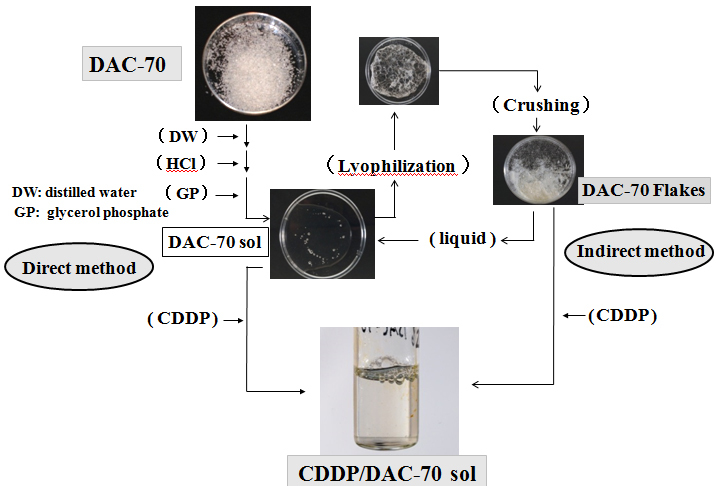 In this study, we originally prepared DAC-70 sol and DAC-70 flakes (DAC-70 Fl) as novel formulations and applied them as both an intact anti-tumor agent and/or a drug carrier of CDDP. Without any modifications to our DAC-70 sol formulation, direct applications of the agent into solid cancer tumors suggested clinically useful anticancer efficacy. As the ip of CDDP/DAC-70 sol conjugates provided longer survival of MM-46 ascites-bearing animals, we considered that the DAC-70 sol could be applied as not only a simple anti-cancer agent but also as a drug vehicle of anticancer drug. Various kinds of anticancer drug-loaded DAC-70 sols warrant further studies on cancer treatments for solid tumors and/or recurrent neoplasms. Except chitin and the derivatives, some kinds of natural biomaterials such as a marine polysaccharide fucoidan and a natural yellow phenolic compound curcumin (turmeric) have been reported to have antitumor activity [10-12], while the papers related to cancer chemotherapies with these materials have been limited. They appear to be still under investigations. Since acetylsalicylic acid (ASA) has been also reported to prevent recurrence of colo-rectal cancers [13,14], we examined proliferation-inhibition effects with ASA solution using HCT 116 cells and HeLa cells by WST method. The ASA solutions revealed lesser anti-tumor activities than that of DAC-70 sol. The ASA and other NASIDs have been reported to be clinically effective in prevention of CRC recurrence, the details on therapeutic factors have not been defined yet . So far as we have experienced, DAC-70 sol suggested superior to ASA in the prevention of cancer cell growth. In in vitro studies, we wondered whether the cell growth-preventing property with 2% DAC-70 sol was owing to its cytotoxic function or cytostatic specificity. Accordingly, we tried to confirm it by our own modified photodynamic diagnostic (PDD) method. Namely, after culturing the tumor cells, each cell was re-cultured with mixed mediums including ALA solution. Then, each medium was changed through to the original medium and incubated for 24 hours. Then, each system was microscopically observed under irradiation of the blue light (wavelength 380-410 nm) to identify viable cells emitting reddish-pink fluorescence. In the microscopic observation, we originally used a sheet of red cellophane paper as a filter in an attempt to shut out unrelated emissions to specifically emphasize the reddish-pink fluorescence of the viable cells. The results showed that the treated cells emitted no reddish-pink fluorescence, and non-treated tumor cells clearly emitted red fluorescence. The difference of the fluorescence between treated group and non-treated group were significantly clear. The fact that the treated cells emitted no red fluorescence strongly suggested the DAC-70 sol functioned as a cytotoxic agent in the systems. We could also confirm the cell viability by our own PDD- modified procedures. Topical administration of the novel agents suggested promising results in cancer treatments. While, since the oncolytic mechanisms with DAC-70 sol still remain unsolved, DAC-70 related pharmacotherapy warrants further studies to secure a novel cancer therapy with minor complications. In this in vitro study, the HFSKF-II cells also revealed to lose the viability by DAC-70 sol treatment. We considered that topical application of the sol would prevent fibrous tissue formations at injured sites in wound healing process. The DAC-70 sol may play an important role in inhibition of the enhancement of excessive tissue formation to induce scar-less wound healing. Further studies on multi potential clinical effects with DAC-70 sol are being expected. The authors are grateful to Dr. Takamori Y, Koyo Chemical Co. Ltd, Osaka, Japan, Mr. Ohmura N, Iwate Med. Univ., Morioka, Japan and Ms. Sakamoto M, Takamatsu Hospital, Morioka, Japan for technical assistance in the experiments. Uragami T, Tokura S (2006) Material Science of Chitin and Chitosan. Kodansha, Tokyo, Japan and Springer, New York, USA. ©2014 Sugitachi A. This is an open-access article distributed under the terms of the Creative Commons Attribution License, which permits unrestricted use, distribution, and reproduction in any medium, provided the original author and source are credited. Department of Surgery, Iwate Medical University, 19-1, Uchimaru, Morioka 020-8505, Japan, Tel: 019-651-5111 (3264); Fax: 019-651-7166.